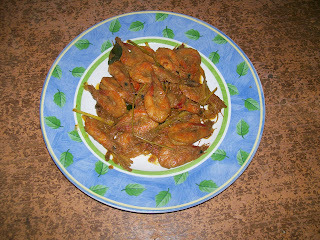 Cooking Adventures : "Sambal Udang"
1. Shrimp mixed with salt, pepper powder and lime juice. Leave for 15 minutes. 2. Heat oil, add ingredients 2 with salam leaves and cooked in a few minutes. Enter shrimp and slosh until stiff, add coconut milk. Cook until completely cooked and the sauce curdle. 3. Take out and enter into the food bowl. Add fried onion. 4. "Sambal Udang" is ready to served.